Georgia « Why did you click here? Georgia (the independent country that is significantly smaller in population and territory than the peach-filled, southern state) is the land of khachapuri, or cheese bread. When those words were uttered to me prior to Christine’s and my trip there to visit her cousin, my heart skipped a beat. Or maybe it was my overjoyed stomach attempting to swallow my heart – either way something told me our eight days traveling around the country were going to be a delicious culinary treat (words I do not employ lightly outside of your local Fuddruckers). Given my predilection for cheese and the fact that bread is fine but even better when utilized as a vehicle to legitimize even more cheese consumption, Georgia and I seemed like a match made in heaven. In short, the khachapuris did not disappoint. I quickly made it my goal to try them all – there is a degree of regional variation, and we were going to be traveling around a lot. Our Lonely Planet book named seven different varieties (typically filled with Georgian Imertian or Sulguni cheese), though a few cheese-less ones substitute beans or meat & don’t really apply to the khachapuri purist (or I assume, given my recent status as a self-appointed one). Regardless I scribbled down all their names and made it my mission to see that they all got crossed out (spoiler alert: eventual mission success – thanks in large part to our ever accommodating host). However, while they were definitely not hard to find (in fact khachapuris are so ingrained in local diets that there is even a national inflation index based solely on the price of these wondrous carbohydrates, a la The Economist’s Big Mac index), what threw us for a loop was we kept discovering new ones! That in and of itself is delightful, but it also meant that trying them all in an eight day span, without overdosing on dairy and having our bodies forever become lactose intolerant as a cruel, cruel response, was going to be difficult. 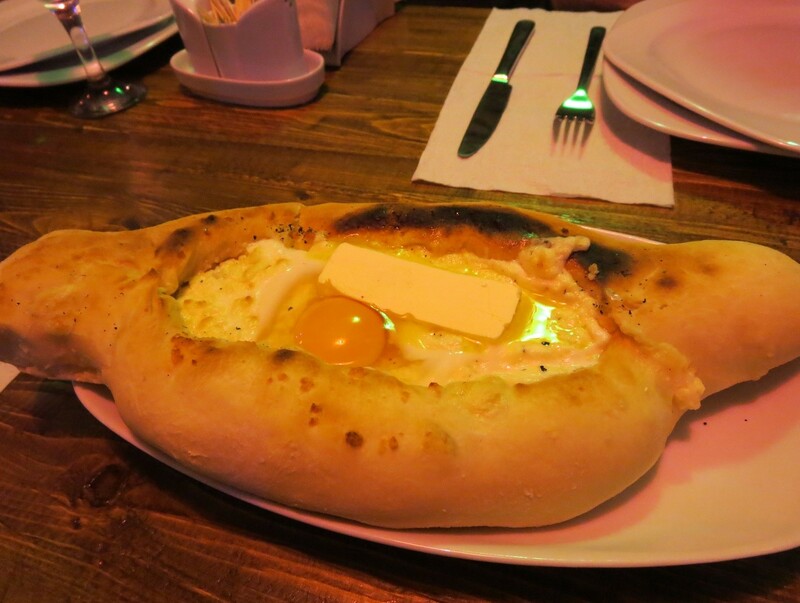 It also makes me unsure of my claim to have tried every Georgian khachapuri – despite repeating that phrase often in past weeks, I am certain it cannot be true (though if you talk to me in the near future, such realities will likely do little to hinder me from continuing to boast it). Other regional variations, or even subtle differences of the same type across different dining establishments, must exist. While we wound up eating 14 in total (or 1.75/day – which for the record is a lot of heavy bread & cheese as these are not small items, but basically pizza-sized pastries), the allure of discovering other potential untouched versions continues to keep me up at night. . .
At any rate, on with the khachapuris. We ate them at all sorts of places, ranging from hole-in-the-wall lunchtime establishments, to a typical rest stop on the way to the Caucasus mountains, to an Ossetian restaurant given that the Russians won’t let us go the separatist region to try the original, to an upscale dining center in Tbilisi, among many other locales. 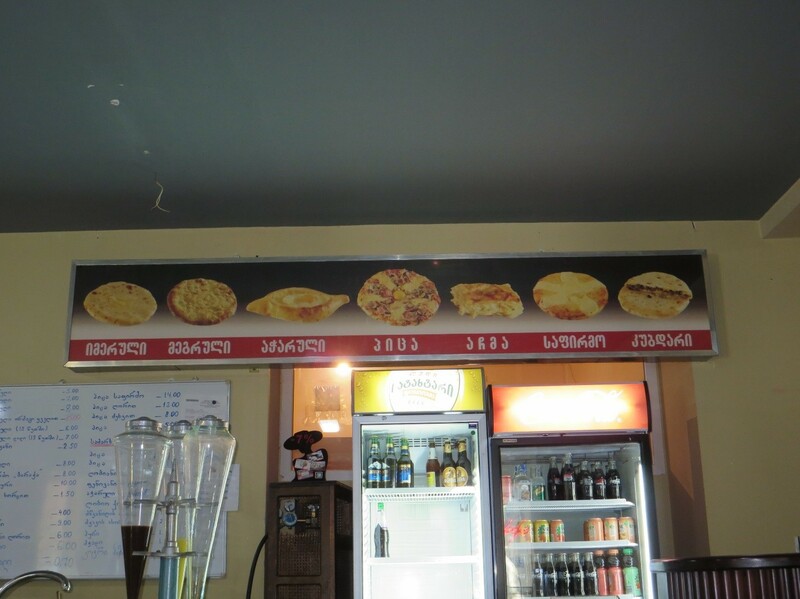 A key theme despite type or location is that they were all delicious – in fact I haven’t met a khachapuri I didn’t like to date (as in up until now, not the verb ‘to date,’ although I did feel very strongly about a few of them – luckily Christine did not seem to notice). Khachapuri on a spit – on a spit I tell you! This is one of the oddest ones, so naturally we wound up trying it first. While it may have a Georgian name, all I know is it’s made on a spit then taken off of the spit, so there is an element of hollow air running through it. Intriguing, but that hole could’ve also been filled with more cheese. Lazurian – I think this is the right name but we didn’t come across this one that often. However, we should, because it involves three layers of cheese. While others (see below) may just have cheese in the inside, or even just on the inside and on top, this bad boy goes further to add yet another layer of cheese on top. It is simply stunning. Megruli – a fairly common khachapuri that combines cheese on the inside with more cheese on top. We ate this one at the upscale Tbilisi restaurant Bread House. Despite my natural disinclination for any location with more than three pieces of silverware on the table, they sure do know how to make a tasty cheese bread. Ploivian – now this one really is a mystery. On our way to Mount Kazbek we stopped at this small town called Pasanauri. There were found a simple rest stop-type restaurant filled with cheery people and good food (also ate many khinkalis, Georgian dumplings, there). On the menu was a khachapuri our dutiful host had never even heard of in her two years in Georgia, and one we never saw again anywhere else (nor had anyone we talked to heard of it). 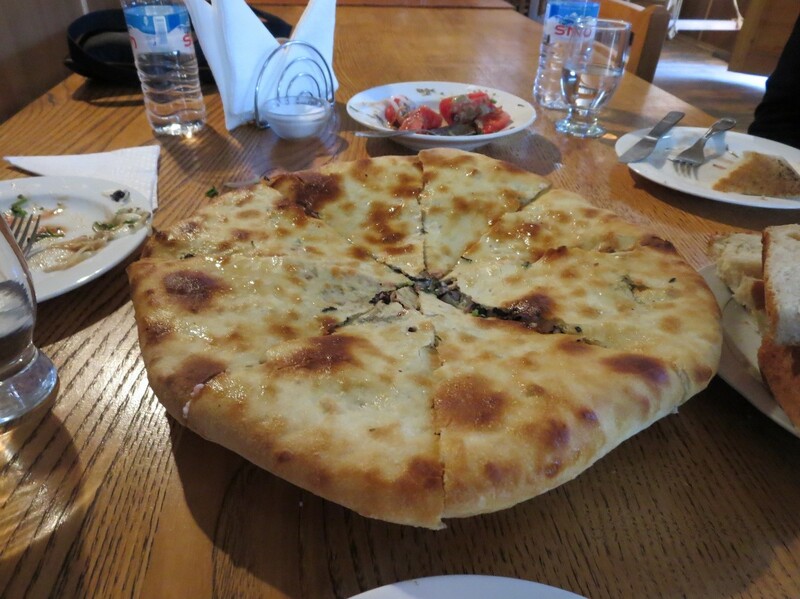 The restaurant proprietor explained that this was a regional khachapuri often found in South Ossetia, the Russian-troop filled isolated breakaway region at the heart of the 2008 war with Moscow, an area that was just on the other side of the mountains found facing westward from the town. While that may explain its scarcity elsewhere, it does not explain its ingenuity. Essentially some Ossentian at some point decided to take your typical heavy cheese and bread dish, and try to add a little bit of health to it, stuffing it with beet greens. While the cutting of the cheese with fresh vegetables was appreciated by some, I was left wondering what it would’ve been like if we had added that extra cheese on top. South Ossetian – Another Ossentian addition to the list (for a breakaway region, they sure are active in the kitchen)! We had to go to a specific South Ossentian restaurant in Tbilisi’s old city named Alanya to check this one off the list. Another example of Ossentian ingenuity, the inside of the bread is stuffed not just with cheese, but also potatoes – what will they think of next!? Achma – After making great progress by eating four khachapuris in our first 27 hours in country, we stalled a bit as we took a hiking adventure up north. Upon our return to Tbilisi we revived our khachapuri mission with a reckless abandon, ordering three for lunch one day, starting with Achma. This khachapuri, which I have been informed this is an Abkhazian specialty (another Russian-occupied breakaway region), is akin to lasagna, without any sauce. Incredibly buttery, the cheese is found in between egg noodle-like layers – delicious and went down smooth, but ultimately felt very heavy. This khachapuri was also baked fresh for us, although there was a moment of confusion as I thought my two-word Georgian vocabulary did not accurately convey we wanted just a piece of Achma rather than the whole fresh baked item (about five times the size). Luckily no one ever pays attention to what I say, especially in Georgia. 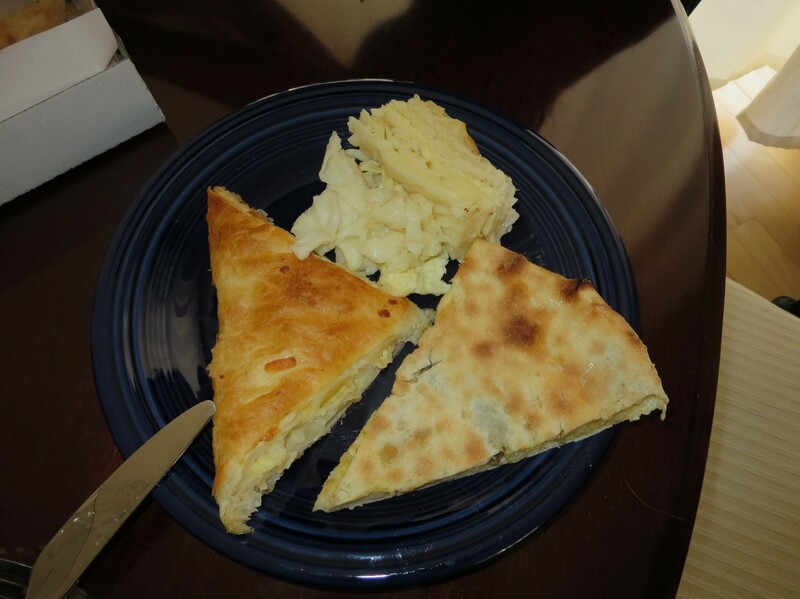 Phenovani – Part of the legendary three khachapuri lunch that will be the standard for years, this has been referred to as a ‘pocket’ or ‘envelope’ khachapuri as the ends are folded into the middle (still stuffed with cheese of course). The dough we had was flaky, causing Christine to refer to it as a good ‘breakfast khachapuri.’ I personally wouldn’t place such limiting restrictions on this khachapuri, or any khachapuri really, ever. Kubadari – From the Svaneti region, this khachapuri breaks up the monotony of constant cheese by adding meat to the mix. The one we sampled had small strips of flavored beef (rather than ground beef). A great idea in theory, but the one we tried in practice seemed to be lacking a bit in the meat department, as the strips were spread out few and far between. We probably should’ve supersized it for just a quarter more. Immeruli – Perhaps the staple khachapuri, this one keeps it simple with just cheese in the middle. Sometimes doing less is doing more. Lobiani (Rachuli) – Another variation on the classic cheese-bread combination, the Lobiani throws beans into the pot. Georgia has good beans, so why not? Adajaran no. 1 – Words, or at least my typed words, cannot do this one justice. Shaped in a boat, similar to a Turkish pide, the khachapuri comes out full of cheese and piping hot. But wait, there’s more – much more! On top of the cheese is a raw egg and a slab of butter for good measure. You mix it all together, so the egg cooks and the butter melts, creating an amazing combination. The bread around it is then peeled off and dipped in the middle, until slowly and magically its all gone. Fully cognizant of the fact that I could never live in Georgia as I would eat this on an unsustainable thrice-daily basis, this quickly became my hands down favorite. We tried it first in the western city of Akhaltsike, closer to its origins in Adjara, but our host had her own favorite spot to do it all over again the next day . . . The Adjara of my dreams . . .
Adjara no.2 – So good it had to be on here twice (though the fact that I only ate this one twice is an eight span is a minor travesty in itself). Stopping by the town of Mtskheta (say that ten times fast, or even just once), we had this bundle of future heart disease another time at one of our hosts favorite ‘fast food’ spots. A fitting way to end a tour that had to end, for if not I would either die, or perhaps finally become the sumo wrestler I always felt I was destined to be. (and 14) Repeats – About four hours following that meal (the typical allotted break time between khachapuris on this trip), we headed to a restaurant called the Black Lion for our final Tbilisi meal, and to meet up with some old favorites. We were told the establishment was a bit of a fusion of Georgian and Western food, replete with interesting options. While we had a Megruli khachapuri for good measure, we also tried an Immeruli one, with a twist. Rather than using traditional Georgian khatchapuri bread, this one focused on regional integration by using the thin Lavash flatbread typically found in Armenia. The lightness of the bread was a nice change of pace from the previous 13 katchapuris, while the cheese was still there. Basically it was a grilled cheese sandwich, and an appropriate culinary finish to our two weeks trip across Armenia & Georgia. So there you have it, 14 khachapuris in eight days, with 11 varieties. If there are any other existing versions out there that I missed, please feel free to fill me in, as it will give me a convenient excuse to return to Georgia in the near future!